Champlain's drawing of the settlement of Port Royal, 1606. "The plan of the settlement was ten fathoms in length and eight in breadth, which makes thirty-six in circumference. On the eastern side is a storehouse of the full width, with a very fine cellar some five to six feet high. On the north side is the Sieur de Monts dwelling, constructed of fairly good wood-work. Around the courtyard are the quarter of the workmen. At one corner on the western side is a platform whereon were placed four pieces of canon; and at the other corner, towards the east, is a palisade fashioned like a platform, as can be seen from this following picture." 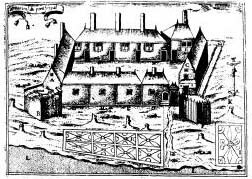 By August 1605, the Sieur de Monts moved the settlement there and was summoned back to France. Francis Grave (c. 1554–1629), the Sieur de Pont Grave was left in charge of Port Royal in his place. After another difficult winter, at the first signs of spring Champlain and the explorers sailed along the coast of Maine and Massachusetts Bay. Visit a reconstruction of the French settlement first placed there by the Sieur de Monts in August of 1605. Costumed interpreters and exhibits bring to life the seventeenth century French settlement. Champlain notes anchoring near Campobello while on his return journey to Port Royal in the fall of 1606.